Judy Clarke, a defense lawyer whose high-profile clients include Unabomber Ted Kaczynski, Olympic bomber Eric Rudolph and Tucson shooter Jared Lee Loughner, speaks at Loyola Law School in Los Angeles on April 26. If he is convicted, the surviving Boston Marathon bombing suspect may be spared a trip to death row thanks to the addition of a criminal defense whiz — with a history of securing life sentences — to his legal team. 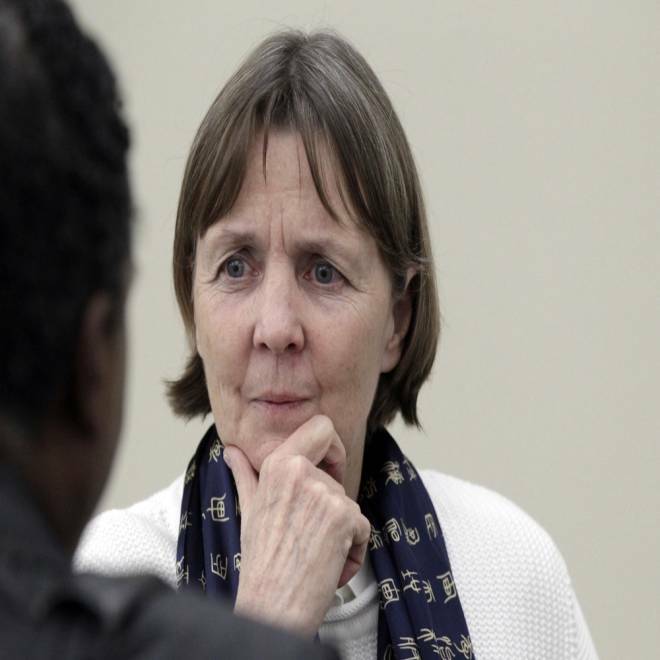 Judy Clarke joined Dzhokhar Tsarnaev's defense team on Monday. She has represented some of the most infamous American criminals in recent history: Jared Loughner, who killed six people and seriously wounded former U.S. congresswoman Gabrielle Giffords in 2011; Susan Smith, the South Carolina mother who drowned her two children in 1994; Eric Rudolph, who pleaded guilty to being the 1996 Atlanta Olympics bomber; Ted Kaczynski, the Unabomber; and Zacarias Moussaoui, a convicted Sept. 11 conspirator. All of those defendants were handed life sentences instead of the death penalty for their crimes. Now Tsarnaev's legal team hopes to keep Clarke's streak alive by having her join his case. "It's no accident that she's the go-to defender in these kinds of cases," said Gerald H. Goldstein, a San Antonio-based defense lawyer and the former president of the National Association of Criminal Defense Lawyers, who has known Clarke for about 30 years. "She makes people want to do the right thing, for the right reason. And that's a tough job." The victim of a carjacking by Boston bombing suspects, a 26-year-old man known as Danny, talks to TODAY's Matt Lauer about the harrowing experience, saying the pair loaded explosives into his car before he was able to escape and call authorities. Often, the "right thing" is for her defendants to acknowledge their crimes, avoid a jury trial and, most importantly, continue living. "They're looking into the lens of life in prison in a box," Clarke said at a legal conference in Los Angeles on Friday, The Associated Press reported. "Our job is to provide them with a reason to live." She also offered a glimpse into what has drawn her into what she called the "black hole, the vortex" of death penalty cases since she first began working on them 18 years ago, when she represented Smith. "I got a dose of understanding human behavior, and I learned what the death penalty does to us," she said. "I don't think it's a secret that I oppose the death penalty." Clarke, 60, doesn't seek out big death-penalty cases; they find her, Goldstein said. Clarke rarely returns phone calls from reporters, and calls to her San Diego office went unanswered on Tuesday. The addition of Clarke to Tsarnaev's team offers clues as to how the defense strategy may play out when the time comes. "They are not going to put on a jihadi defense," Harvard Law School professor Alan Dershowitz told the AP, adding that Clarke's presence shows "they are going to litigate hard against the death penalty." "The client wants to live, and he wants to avoid the death penalty," Dershowitz said of the only surviving brother in the Boston Marathon bombings. "They are not going to say, 'I want to die, I want to join my brother.'" Clarke has been in private practice in San Diego for years, working with her husband, law professor Thomas "Speedy" Rice, but she still takes public-defender assignments. She is a native of Asheville, N.C., who grew up in a conservative Republican household, according to The New York Times. She got her undergrad degree from Furman University in South Carolina in 1974, followed by her law degree from the University of South Carolina in 1977. She moved cross-country to practice law the following year, and has spent most of her career in California and the Pacific Northwest. "You're going to have a hard time finding somebody, even those that are her opponents, who doesn't respect her. Some people may not like her, but she commands respect," Goldstein said. Clarke's skill in the courtroom lies in her ability to empathize with clients, even when they are being charged with horrific crimes, say colleagues. "She's a genius. She's among the smartest, most thoughtful people you'll ever meet," said Todd Maybrown, a criminal defense attorney in Seattle who has known Clarke since the early 1990s. "She's very intense and cares very deeply about the law and her clients." Added Goldstein: "She does as much in terms of humanizing the judge and the jury and the other lawyers as she does humanizing her clients. There's a reason people can identify with her." Investigators have taken a DNA sample from the wife of slain suspect Tamerlan Tsarnaev to compare with the female DNA discovered on the pressure cooker from one of the Boston bombs. The FBI is also examining whether or not Tamerlan Tsarnaev met with two men in Dagestan who are considered radical Muslims. NBC's Pete Williams reports. Clarke's rise to prominence began when she defended Smith, who was on trial for drowning her two young children. A law school classmate of Clarke's, David Bruck, invited her to join the defense team. Clarke and Bruck nearly crossed paths again: While Tsarnaev, the 19-year-old Boston bombing suspect, recovers from his bullet wounds in a prison hospital bed, his public defender, Miriam Conrad, asked a Boston federal court to appoint two death penalty experts to the case: Clarke and Bruck, who is now a law professor at Washington and Lee University, according to the AP. U.S. Magistrate Judge Marianne Bowler rejected the request to let Bruck join the team, but agreed to appoint Clarke, who will join the three federal public defenders already assigned to Tsarnaev's case. Clarke has served as the head of federal public defenders offices in Idaho, eastern Washington and San Diego, served as president of the National Association of Criminal Defense Lawyers and argued before the Supreme Court. Clarke's experiences with her clients has led to her becoming an opponent of the death penalty, Bruck told The New York Times in 2011. “Judy would probably say if the public saw everything she sees, it would look at the client or the case differently,” he said.